El Salvador’s accession this week to the Rome Statute is the clearest expression of the country’s commitment to justice for grave international crimes, and brings the Latin American region a step closer to full representation at the International Criminal Court (ICC). The move comes after over a decade of advocacy by international and local civil society. 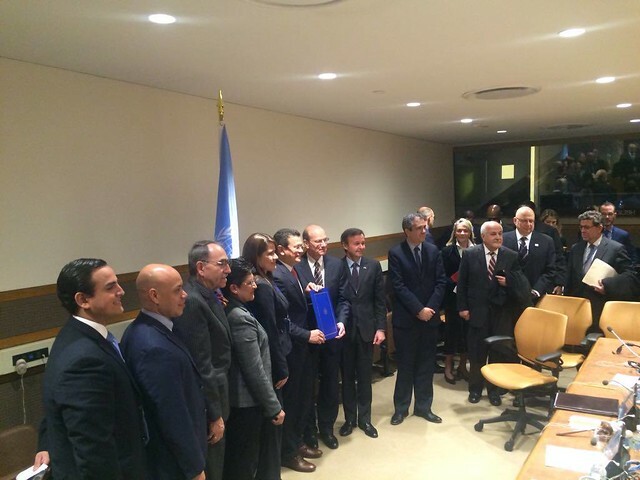 On 3 March 2016, El Salvador deposited its instrument of accession to the Rome Statute, the ICC’s founding treaty, at United Nations headquarters in New York, the last formal step needed to join the ICC. Global civil society congratulates El Salvador as it honors commitment to justice for grave crimes by becoming 124th state party to the Rome Statute. Civil society in El Salvador welcomed the accession, highlighting the important advocacy carried out in the country over the past decade. In a well-attended and moving ceremony at UN headquarters, Salvadorian authorities—led by the Ministry of Foreign Affairs H.E. Hugo Martínez Bonilla—reaffirmed the country´s firm commitment to the principles enshrined in the Rome Statute, and thanked the different actors that had contributed to the accession process. See more images of the ceremony on our Flickr page. Pace also highlighted the crucial role of the Parliamentarians for Global Action, a member of the Steering Committee of the Coalition for the ICC, in the accession process. 29 of 35 states in the Americas have ratified or acceded to the Rome Statute, thereby accepting jurisdiction of the International Criminal Court. El Salvador also became the 28th state to accede to the Kampala amendment to the Rome Statute on the Crime of Aggression and the 30th state to accede to the Kampala amendment to the Rome Statute on Article 8 (war crimes). More information. In 2009, then-president Mauricio Funes declared his commitment to Rome Statute accession. Current President Sánchez Ceren, who assumed office in 2014, has now upheld this promise. During the Funes presidency, the foreign ministry issued a positive decision on accession in 2012, and submitted a Rome Statute accession bill to the presidential house. In May 2014, following strong advocacy from civil society as well as the key role of engaged parliamentarians, President Funes submitted the bill to congress, together with a bill on the implementation of Rome Statute crimes and principles into national law. On 26 November 2015, El Salvador’s parliament approved the bill and accession to the Rome Statute. NGOs were instrumental in ensuring that government authorities addressed the legal and political obstacles that had prevented El Salvador from acceding to the Rome Statute. The campaign for Rome Statute accession included awareness-raising with government officials, parliamentarians, and the general public. Civil society also held advocacy meetings, sent letters to the president and government officials, provided technical assistance and addressed misconceptions on the role and mandate of the ICC. In addition, the Coalition for the ICC Campaign for Global Justice focused on in November 2012, October 2013 and October 2014. The long-running Campaign for Global Justice calls on different countries each month to ratify or accede to the Rome Statute and adopt national laws to prosecute ICC crimes domestically. More information.